Itaewon's antique furniture street is constantly changing. According to some storeowners, antiques used to be collected by the rich, upper class in the past, but now even those in their 20's have gained interest. What's interesting about these shops is that many of the owners cultivated their business because it was simply a hobby and a genuine interest of theirs. A common sentiment that was shared between many of the storeowners is that upkeeping these stores could not have been possible without a genuine love for antiques. To them, it's not just about the profit. Check out Itaewon for its lovely, beautiful antique/vintage goods! Itaewon's antique furniture street might cater towards those who like highly ornate and decorative items, but the antique shopping mall in Dapsimni will probably attract a different sort of crowd. 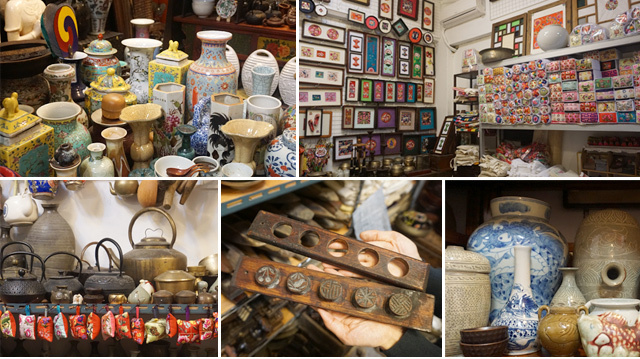 The type of items you will find here are all antiques from countries like Japan, China, and of course Korea. Here, an item that is dated to be 60 years old is considered to be very "young", meaning that there are some items that go way back in time! When it comes to pricing, the decision is made according to the quality and elements of the item rather than the age. As soon as you enter this space, you'll probably come across groups of elderly women and men here and there, perhaps negotiating prices, doing business, or just casually having a conversation. The overall atmosphere of the flea market encouraged a sense of community and you could tell that many would come here as a daily routine. Although flea markets can sometimes be disorganized, a first-time visitor would get the sense that there is definitely a certain way of doing things here. The flea market is also refreshing because you can freely look around without receiving much pressure to buy something. You can find an extremely wide variety of items such as clothes, shoes, household items, memorabilia, etc.